The name kwaZulu translates roughly as "Place of Zulus", or more formally "Zululand". 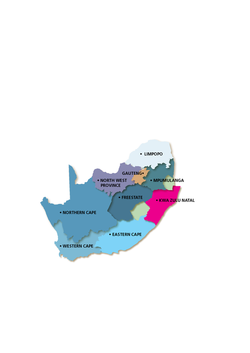 It is called the garden province and is the home of the Zulu nation. Two natural areas: the iSimangaliso Wetland Park and the uKhahlamba Drakensberg Park, have been declared UNESCO World Heritage Sites. Located in the southeast of the country, the province has a long shoreline on the Indian Ocean. It borders three other provinces and the countries of Mozambique, Swaziland, and Lesotho. Its capital is Pietermaritzburg, and its largest city is Durban.